CM Launcher 3D Review: Fastest 3-D Launcher? Is It? Home Android CM Launcher 3D Review: Fastest 3-D Launcher? Is It? Well, CM launcher which is normally known for its performance and security has undergone a major change. A complete makeover to introduce a 3D engine (even with a new logo). Although, you would get to see the new logo whenever it goes live on Play Store after public release. Cheetah Mobile Inc definitely took the right decision for a makeover to compete with other launchers at the Play Store in terms of future-proof user interface and a smooth user experience as well. We normally encounter people questioning about privacy risks on Cheetah Mobile products on Play Store. 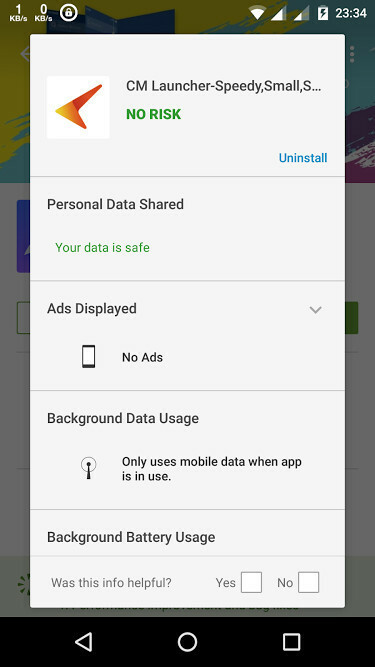 So, we checked CM Launcher 3D with Norton Mobile Security (Premium) which gives a detailed insight about the apps on various factors (personal data shared, battery usage, background data usage and contains Ads) and it turned out to be risk-free. You can find the screenshot below for better understanding. Say what? Yes, it’s time to review CM Launcher 3D. Yeah! It is damn smooth. The new user interface is really smooth, feels like it’s in a flow. That’s a good sign. The new 3D transition effects make it look smoother being incredibly beautiful at the same time. What’s new with the 3D engine? The 3D engine offers various new transition effects and other attractive 3D movements as well. 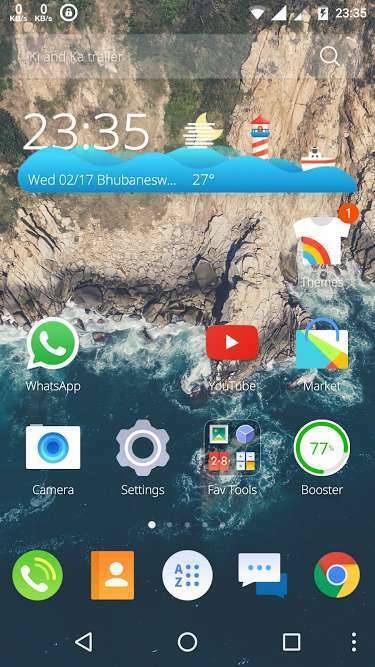 First, talking about the home screen, it features a 3D weather widget that is dynamic and responsive. And, the second best impression we got out of it was the 3D clock widget. The clock widget is as beautiful as a premium widget (Well, that’s what I felt). There’re two modes of view in it, one is a simple 3D clock and the second being a clock resembling a vault locker. Transition effects? Are they attractive enough? 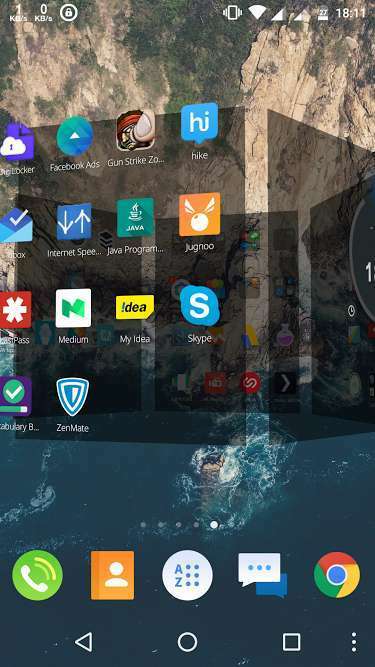 Well, CM Launcher 3D empowers a user to apply transition effects on home screen, folders and unfolding (opening the app drawer or closing a folder). There are 13 types of transition effects for home screen or folders, and 5 unfolding effects. However, there isn’t any exclusive effect offered, but by far, these are the best free 3D transition effects you would find in a launcher. Not to forget, you can get these effects on Next Launcher as well, but you’ll have to pay a hefty price, and, in contrast, CM Launcher 3D provides a smoother and lighter 3D experience for free. App drawer? I can play with it all day! Now the app drawer opens with a transition effect (can be set from the effects option -> Unfolding). 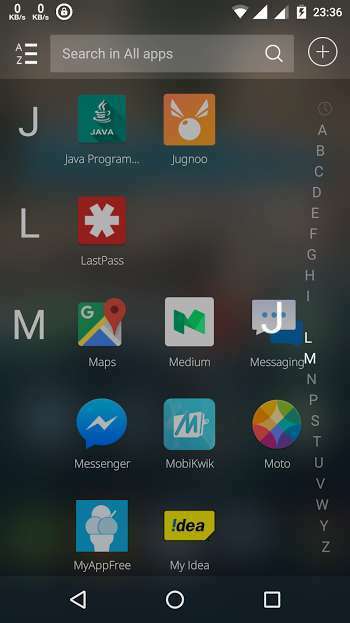 It doesn’t end here, when you try to search for an app by tapping on any letter from the right sidebar of the App drawer, you’ll find the list of letters turning into a 3D elastic version (as shown below). If you continue scrolling through the letters up and down, you’ll feel like stretching a rubber string (unless you’re as crazy as I am) and I can do that all day along! In our extensive use of the launcher running on Moto X Play (aka Droid Maxx 2) we didn’t find any visible glitch as of now. The launcher works as expected and is smooth enough to give a 3-D experience to a smartphone user. No abnormal battery drain was observed nor any crazy background data usage. You May Also Like – How To Protect Your Android Device From Malware? It is resource friendly, consumes less RAM and works on low-end devices as well with no visible lag. Is it the fastest 3D launcher available on the Play Store? CM Launcher 3D is indeed the fastest 3D launcher available on the Play Store. Yes, Next launcher and others are fast as well, but aren’t resource friendly (consumes a lot of battery and RAM). So, considering every valid factor, we can definitely tag CM Launcher 3D is the fastest 3D launcher available at the Play Store. It’s a fast 3D launcher which provides an optimum 3D experience. Doesn’t take much of the resources and works great on low-end devices as well. It could have more features in the near future. The UI quality and performance is good. Considering other 3D launchers available on the Play Store, it would be the best alternative for those who always wanted a resource friendly 3D launcher. 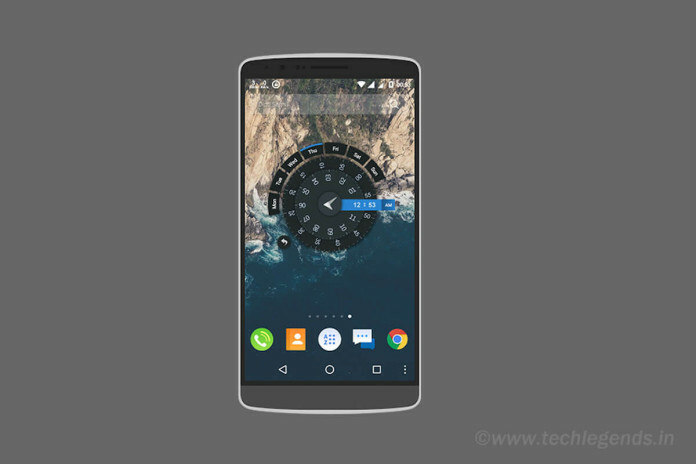 The CM Launcher 3D is believed to have some advanced options to manage the icons and rearrange them or resize. However, it has not yet been implemented. We’ll keep you posted if we encounter a recent update adding the above concerned features. Check out the official CM Launcher 3D concept video to know what more they would be adding (maybe) before the final public release of CM Launcher 3D. You can get the CM Launcher 3D beta here. CM Launcher is the lightest 3D launcher! And, is incredibly smooth providing a nice 3D user experience as well. I’m sorry, but you’re using Norton as the basis of your security checks? A company that’s software has been well known to slow people’s devices periodically once the subscription period ends, as a form of persuasion to “clean up their device” with a new subscription. And that’s before I even mention the massive security flaws it has had in the past. It’s no wonder that the tech geniuses I know say that the best course of action is to remove it immediately, and not even using Norton’s own uninstaller. They recommend a third party uninstaller to ensure it is thoroughly removed. This CM Launcher looks like, actually more than looks like TSF Shell. The clock you like so much is for sure from TSF and TSF has been out for years. Something fishy here. Yes, that’s no shock here. It’s not completely the same – there’s a lot of clock widgets which offer the same as well.